The LotR trilogy made some significant condensation to the timeline, with the Quest taking place immediately after Bilbo's 111st birthday, instead of 17 years later, as in the book. As such, is there any official info, in the style of 'The Tale of Years', regarding the movie timeline? Specially with respect to ages of the various players in the saga, and also with reference to years according to a Middle-earth calendar? As in, does the LotR movie trilogy still take place during 3018 T.A. and it is the Hobbit that has now been taking place around 17-years-later-than-in-the-books or vice-versa? ETA Note: I am not looking for a comparison of the movie timeline with the book timeline, so much as just the movie timeline with extra bonus for any canonical movie mention of date. 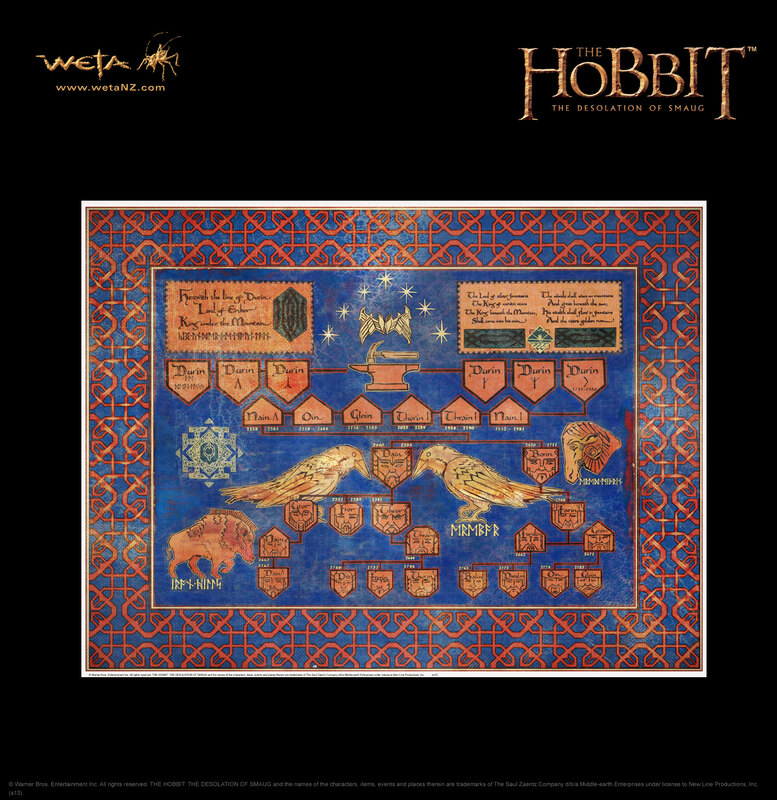 For example, this interesting movie canon tapestry linked in the comments below which put Year of Births on some of the dwarfs: e.g. 2746 (of presumably the Second Age) for Thorin. So information like number of years passing between events, with bonus for actual dates of the 'They did this in numpty numpty numpty six of the Second Age' or 'Blippity Bloppity Four of the Shire Calendar' from sources in the movies is what I'm looking for. LOTR:FOTR SEE, scene 2 "Concerning Hobbits"
This happens at the beginning of the FOTR movie, in the first scene after the prologue, only present in the extended edition. Note that the opening scene of TH:AUJ (old Bilbo writing) and the final scene of TH:BOTFA (old Bilbo greeting Gandalf) depict events happening in the very same day. Movies vs books: in the books, Bilbo's 111st birthday happens in year 3001 TA (Third Age) = 1401 SR (Shire Reckoning); we can easily reconcile this difference supposing a slightly different conversion for Shire reckoning. [Gandalf:] For sixty years the Ring lay quiet in Bilbo's keeping prolonging his life. Delaying old age. LOTR:FOTR SEE, scene 10 "The Shadow of the Past"
[Frodo (voice-over):] Thirteen months to the day since Gandalf sent us on our long journey we find ourselves looking upon a familiar sight. LOTR:ROTK SEE, scene 75 "Homeward Bound"
Movies vs books: the 60 years gap is in the book too (from 2941 TE to 3001 TE); I couldn't find a book quote concerning the duration of Bilbo's voyage, but the Tale of Years in Appendix B states that he left in 2941 TE and came back in 2942 TE, which is compatible with the 13 months of the movie; Frodo leaves the Shire in September 3018 TE and, together with the other three hobbits, re-enters at the end of October 3019 TE (13 months later). The obvious chronology difference is the gap between Bilbo's and Frodo's departures from Bag End. In the books it's a 17 year gap; in the movies I think we can assume that Frodo leaves at some point in the year following the long-expected party. Anyway, this change has no repercussions apart from Aragorn's age at the time of the battle of the five armies, as time expressions in the LOTR movies refer either to a moment following Frodo's departure (so the time difference is not affected by the gap duration), or to an event happened long before (so that a 16 year discrepancy is not so relevant). [Elrond:] I was there Gandalf. I was there three thousand years ago when Isildur took the Ring. LOTR FOTR SEE, scene 24 "The Fate of the Ring"
[Gandalf (reading):] The year 3434 of the Second Age. Here follows the account of Isildur, the High King of Gondor, and the finding of the Ring of Power. LOTR:FOTR SEE, scene 8 "The Account of Isildur"
Movies vs books: perfectly compatible; the only difference is the compression of the war of the last alliance to just the Dagorlad battle (without the several year long siege of Barad Dur), so that year 3434 SA (which in the books is the year of the Dagorlad battle) in the movies is also the year of Sauron's demise and the end of the Second Age. [Galadriel (voice-over):] History became legend, legend became myth, and for two and a half thousand years the Ring passed out of all knowledge. Until, when chance came, it ensnared a new bearer. [Galadriel (voice-over):] The Ring brought to Gollum unnatural long life. For five hundred years it poisoned his mind. And in the gloom of Gollum’s cave it waited. LOTR:FOTR SEE, scene 1 "Prologue"
Movies vs books: perfectly compatible. Movies vs books: It is not really clear what Elrond is referring to in the movies. The book cronology places in year 2509 TA the goblin ambush to a group of Rivendell elves travelling to Lorien (including Elrond's wife Celebrian), which could fit the definition of "last time the elves were attacked". In the books there is a period called "the Watchful Peace", lasting about 400 years from 2063 TA to 2460 TA, that precedes the creation of the White Council. TH:DOS SEE, Scene 1 "The Quest for Erebor"
TH:AUJ SEE, Scene 7 "A Map, a Key and a Contract"
TH:AUJ SEE, scene 1 "Prologue"
TH:AUJ SEE, scene 19 "Moon Runes"
TH:DOS SEE, scene 23 "The Home of Bars"
TH:DOS SEE, scene 27 "The Parting of the Company"
[Thorin:] “The sun will soon reach midday; let’s find the hidden door into the mountain before it sets. TH:DOS SEE, scene 28 "The Lonely Mountain"
There's no official full timeline that I'm aware of, but we can work a few things out. The prologue ("Concerning Hobbits") to the Extended Edition of Fellowship of the Ring places Bilbo's birthday party in the year 1400 (Shire Reckoning), which (assuming the same conversion system as the books) equates to Third Age 3000 (in the books Bilbo's party was TA 3001 or SR 1401). The 22nd day of September in the year 1400 by Shire reckoning. In An Unexpected Journey, it is suggested that Smaug's attack on Erebor took place 60 years earlier again, compared to 171 years in the books. Rumors have begun to spread. The dragon, Smaug, has not been seen for 60 years. Also in An Unexpected Journey, Elrond suggests that the defeat of Sauron was a mere 400 years earlier. Gandalf, for 400 years we have lived in peace ... a hard-won, watchful peace. The Ring brought to Gollum unnatural long life. For five hundred years it poisoned his mind. History became legend, legend became myth, and for two and a half thousand years the Ring passed out of all knowledge. At this point I'll stop, because it's clear that there's little relationship between the timeline of the movies (in particular the Hobbit movies) and that of the books, and that even the internal consistency of the movies is doubtful. Not the answer you're looking for? Browse other questions tagged the-lord-of-the-rings movie tolkiens-legendarium the-hobbit time or ask your own question. How did Thranduil know about the 'infamous' Strider when the latter was only 10 during the Battle of the Five Armies? When Thranduil tells Legolas to go north, what did he mean? Why does Frodo appear in Peter Jackson's The Hobbit? Could Aragorn have been featured in The Hobbit: An Unexpected Journey? Was Arwen called Evenstar at birth?